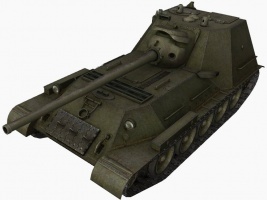 The SU-100M1 plays like a turret-less T-44 in many, many ways and is quick enough to wolf-pack with mediums. 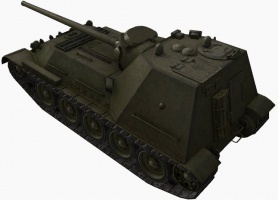 Its gun has average penetration for a Tier 7 Tank Destroyer, but the tank's not maneuverable enough to flank and lacks accuracy to reliably hit the opponent's weak points. The gun does not disperse much even while moving, so it can take some shots on the move. 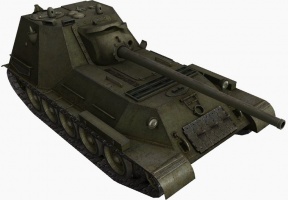 The armor can bounce some shots, primarily from opponents below your tier, but with proper cover you can bounce even Tier 8 shots. As an aside, this tank's excellent maneuverability makes it more resistant to getting pinned by mediums than your average Tank Destroyer; as such it is safer to play a bit more aggressively. 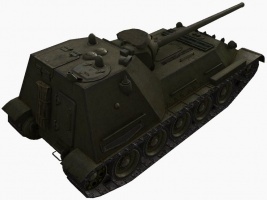 Research the 100 mm LB-1C Gun. This page was last modified on 26 March 2018, at 20:14.